“Bubbles Learns Forgiveness” from Christian Faith Publishing author Ruth Davis uses the story of a young adventurer who has lost it all to teach readers the value of peace and forgiveness. With Mr. Grouper and God’s wisdom as her guide, Bubbles will overcome her loss and anger. “Bubbles Learns Forgiveness”: a story for young readers about the need to overcome anger and embrace forgiveness. 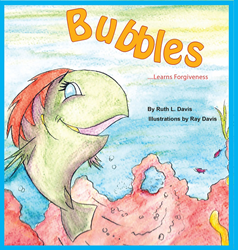 “Bubbles Learns Forgiveness” is the creation of published author, Ruth Davis. Published by Christian Faith Publishing, Ruth Davis’s new book is a story about forgiveness. Bubbles returns home to tell everyone about her great adventure, but quickly discovers everyone is gone and her home has been destroyed by a shark. Angry and scared, Bubbles encounters Mr. Grouper. The old and wise fish reminds her that anger and unforgiveness is not the way of the Lord. “In Bubbles Learns Forgiveness,” Bubbles goes on an emotional journey that takes her from anger to peace. Bubble learns that forgiveness is a choice. Through God’s grace, anyone and everyone can make the right choice. View a synopsis of “Bubbles Learns Forgiveness” on YouTube. Consumers can purchase “Bubbles Learns Forgiveness” at traditional brick & mortar bookstores, or online at Amazon.com, Apple iTunes store, Kobo or Barnes and Noble. For additional information or inquiries about “Bubbles Learns Forgiveness”, contact the Christian Faith Publishing media department at 866-554-0919.